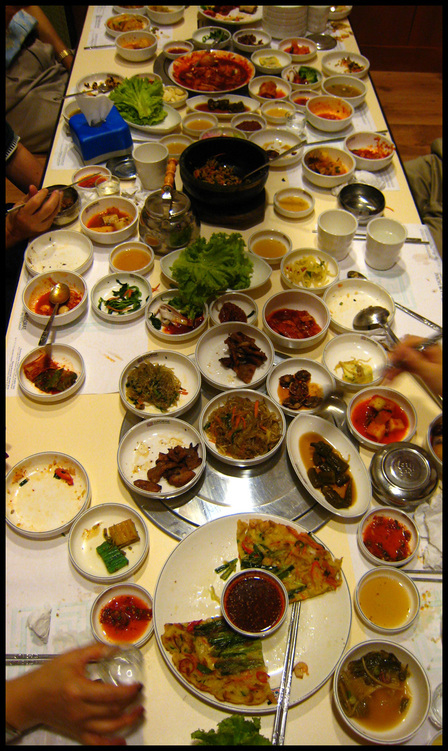 Our family in KL is still very much in Korean mood. 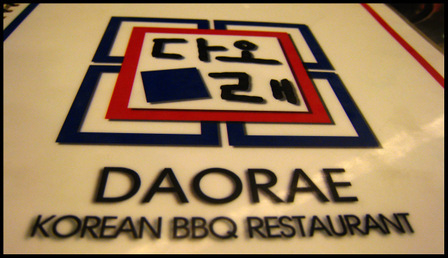 We went to Daorae, chosen randomly by my brother from the dozens of similar restaurants in mini-Korea of Sri Hartamas, not once but twice over a week. Daorae is huge and popular. They are also friendly and efficient even though the staff speak very little English. Their BBQ selection is big, and comes with lots of garlic, lettuce and side dishes. Come to think of it the rest of the menu selection is pretty big too. Something for everyone, who cares about authenticity as long as it tastes good? 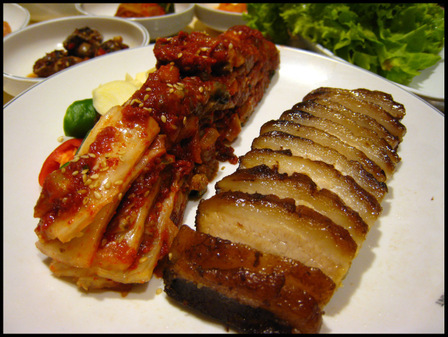 I love their bo-ssam served with terrific oyster kimchi. 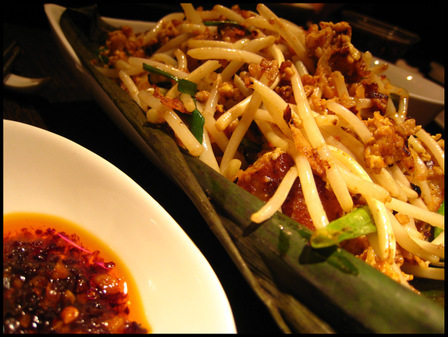 They also do stir-fried rice cakes with spicy sauce, excellent. For chilli head husband, he was in nirvana with all their spicy stews. Soon dubu was not so good, but that's because I've had some good ones in Korea where the portions are so generous they are a meal in themselves especially at the end when they would cook rice in any leftover broth; here it is just a supporting player to the big BBQ boys. 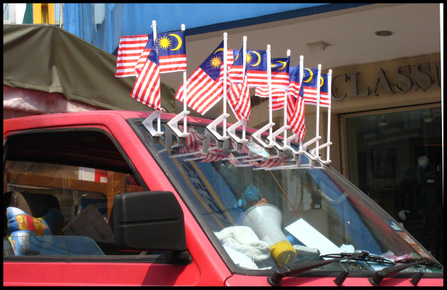 The political scene in Malaysia is one big hysterical joke but it's okay, we still love you. 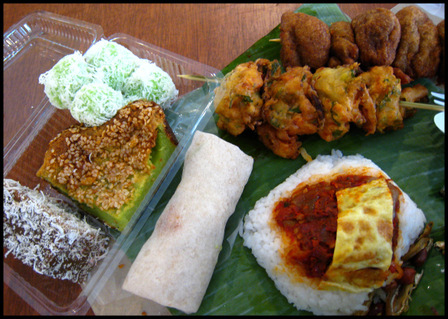 Not least because in Malaysia the eating is so good. Even in shopping malls. One night at dinner at Reunion restaurant in Bangsar Village my brother kept saying how good their dim sum was. He was right, the dim sum here is as refined as their downtown competitors. Poor V, she was not used to eating restaurant Chinese food especially dim sum because the one time we ate at a dim sum restaurant in Paris our food came with a serving of little black pellets that I suspect were rat droppings. Anyways, she spat out her first bites of dan dart, cheong fun etc but curiousity eventually got the better of her and she was soon happily digging into custards and fishing out sweet nuggets of cha siu from the cheong funs. We went to Bangsar Village almost every day. 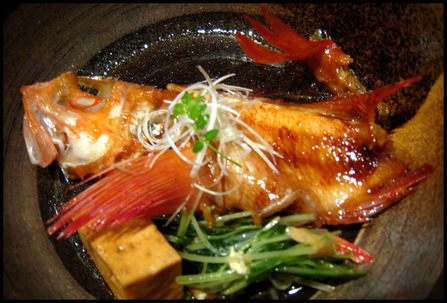 The Japanese restaurant Mizu is very good and it's my mother's favourite neighbourhood restaurant for she almost always suggests this when she does have time to eat lunch with us. Their set lunches are delicious and well-priced and their a-la-carte menu has some innovative east-meets-west combinations. What I also like is the little push cart stall outside the supermarket that sells kueh. It's only one of many stalls of the La Cucur chain but the quality is above average. This trip I managed to satiate my craving for popiah, starting with the twee little 'basah'(wet) version here and when Sunday night rolled round, we headed to the pasar malam at Bangsar where the uncle who operates the Stadium Popiah stall has been a fixture for nearly 30 years, assembling and rolling out his signature popiah. It's very relaxed even though the queue never abates. He even told the crowd not to bother queuing, his memory is so good he can remember everyone's order in the correct sequence. Another 'nearly 30 years' experience is at the coffeeshop in the corner of Jalan Batai/Jalan Beringin. It has a grandioise name of Shangri La. I say 30 years because our family moved to this Damansara neighbourhood when I was 13 and I am now already 39 years old, but it's been around even longer. The food may not be the best in KL, though I would still maintain that the char kway teow (CKT) from the coffeeshop a few doors down (he was in Shangri La at one time) is my favourite in all of Malaysia. A trip home will not seem right without meeting my dad for lunch in Shangri La. 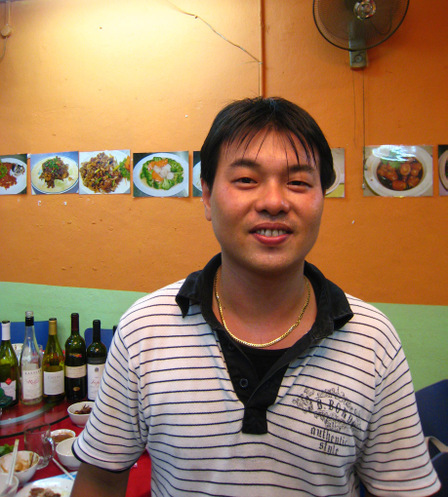 He and husband will ta-pow the char kway teow before meeting up the coffeeshop for rojak, wantan noodles and cups of strong coffee. The wantan noodles have just the right springiness. At one time there was a very good prawn noodle stall, unfortunately the owner had a gambling habit and he eventually gave up his stall. 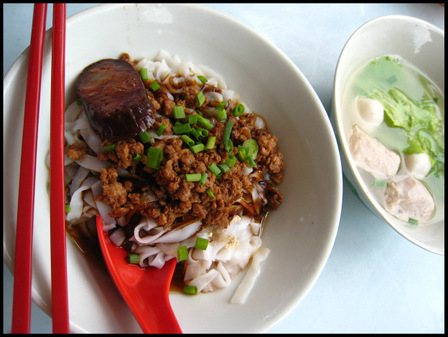 The vendor of the minced pork noodles worked really hard to send their children to university. When their children grew up, the couple retired. Their pork balls were handmade and the noodles always very tasty. The new owners added liver sausage to their noodles, but these days the sausages are of lower quality and the pork balls a lot more industrial tasting. So much for nolstagia. There is another Shangri La that we grew up with. The Shangri La Hotel was the first five star hotel in KL when it opened, about 30 years ago. My maternal grandparents love their Chinese restaurant Shang Palace. 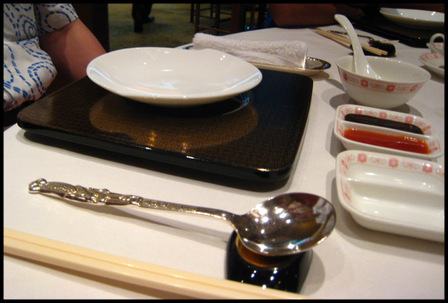 Over the years they would often invite us to join them for lunch at other fine-dining Chinese restaurants as they open all over the city, but Shang Palace was always a constant. Shang Palace today is better than ever I have to say, the decor is up to date modern Chinese, the service impeccable and the dim sum exemplary. They provide two condiment dishes. 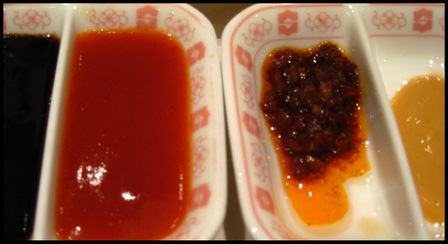 Default chilli sauce and brown bean sauce the latter of which is hardly seen in most dim sum places now. House XO sauce not as good as that of Li Yen, Ritz Carlton Hotel, but bonus points for the elusive yellow mustard. On the lazy susan would also be found chopped raw garlic. 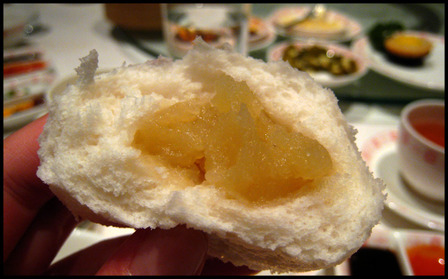 Another memory of those languid dim sum lunches with the grandparents is the pungent overhanging reek in the car as everyone, except me and my sisters, would have chomped through a tonne of garlic in bravado and blind belief that garlic is the universal cure. We stack the baskets high to keep them warm, also they are no more space on the lazy susan. 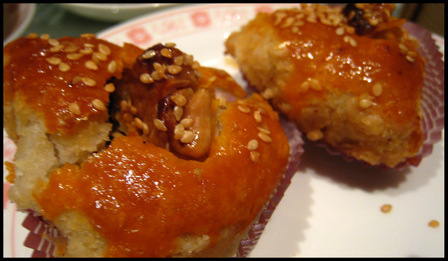 Cha xiu sou is already very good, the walnut topping was just more gilding but I'm not complaining. The dim sums are very old-school here, no cute rabbits. Fried fishballs. 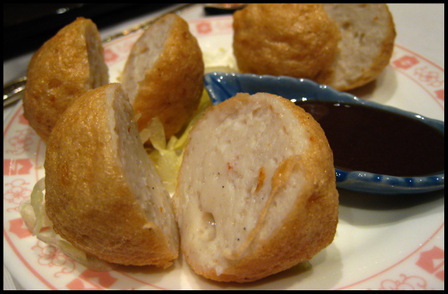 Nobody did steamed fish balls like them, now the fried version reigns. Some people like it with a bit of fishy sauce on the side, I liked them fine just as they were. I think I ate like 2 plates by myself. The other day I was very happy to discover red bean desserts in Paris. But lotus paste, that is a rare thing. Not here, pure lotus-ness. Where else did we eat? Madam Kwan's of course. Satay Kajang H.J Samuri in Damansara Uptown. A ghastly and expensive dinner at Sri Ayutthaya in Damansara Heights. Nasi kandar and roti canai in Bangsar. 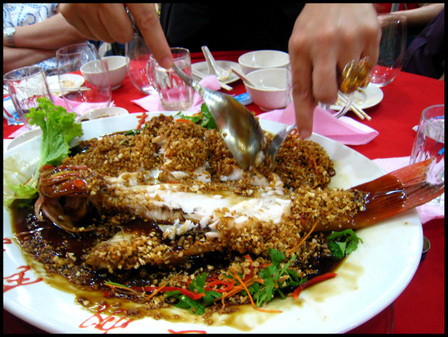 Plus a magnificient seafood dinner at Greenview Restaurant. Previous dinners have always fallen short of my expectations yet the family return there again and again, well this time I saw the light. Sweet firm-fleshed crabs fried with egg yolk PLUS curry leaves was die, die must try good. Live Prawn noodles was equally good, the prawns particularly large, succulent and their heads heavy with roe. On the bus journey back to Singapore I bought a packet of nasi lemak at the rest-stop because I don't know why but I am unable to walk past a nasi lemak bungkus without wanting to eat it. In Singapore we ate some more. Thosai at one of the coffeeshops near the Old Rex cinema. Our hosts invited us to a Veuve Clicquot dinner. The 1988 vintage was so delicious, it tasted like preserved limes the wine expert said, he was quite right and I had about 3 or 4 glasses which left little room for the other years. There was also a seafood dinner with friends at Long Beach Restaurant in Dempsey Road, burp. Finally ending with a big, and rather emotional, bang of a lunch at Hokkaido Sushi. Goodbye my beloved family and friends, until the next time we meet! We have been back for a month. It had been real busy what with V going to school and getting on without live-in help. I would be lying if I said it was easy, the apartment's big and the kid and dogs take up a lot of time and attention especially their feeding and grooming. Finally, with some organisation and discipline, and plenty of farming out of jobs to robots and professionals, I am down to about 2-3 hours of daily domestic drudge which means I can now hope to reclaim some of my normal routine of web-loafing, crafts, French and exercise but blogging will still continue to be erratic for a few more weeks. The weather turned very cold last night. I pulled out a heavy shawl from the cupboard, put on socks, filled up the water bottle and plugged in the heaters. Other people's buildings have central heating, ours has not kicked in yet and probably won't until husband and the other tenants start complaining to the building manager. I feel like cooking cold-weather foods these days, such as the pork stew in the above image. It was from a dinner we attended at husband's colleague's home a few months ago. 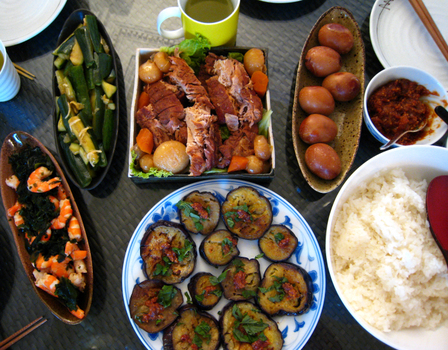 His Japanese mother in law cooked a beautiful meal of grilled aubergines with miso paste, steamed prawns with seaweed salad, pickled cucumbers and that delicious stew of pork, root vegetables and hard boiled eggs in a soy broth. What will we find in the market tomorrow? Can't wait! Some of the roads outside our apartment is closed. There are security people and police all over the place and the helicopters are circling overhead. The occasion: visit of Pope Benoit XVI. He arrived this morning and the afternoon is taken up with meeting the Sarkozys and religious leaders. Tonight he says mass at Notre Dame and tomorrow there is an open air mass at Les Invalides. Do not attempt to visit these areas this weekend. At the gym, actually it is called an 'institute' which sounds so much more glamorous, my Power Plate coach told me that the pope will be staying at a convent on Avenue President Wilson. Which explains why the market along that avenue is not open tomorrow. Apparently they even have snipers at the ready in case of assasination attempts. Many shops and business around the area are not bothering to open because their customers cannot reach them until the Pope leaves for Lourdes on Sunday. I went back to the gym last week. The first day was really tough, the coach who knows that my holidays are food-focussed joked that all the restaurants went into my stomach and made it all flabby again. He was so right! We didn't have to make much of an effort. Most of the times our friends chose the venue and we simply showed up. Like the first dinner at Cherry Garden of the Mandarin Oriental Hotel. The host booked a private room and being a regular, the chef and the service staff did their best to make it a memorable dinner. Beautiful decor, smart service and excellent food. Ahh so nice to be back. 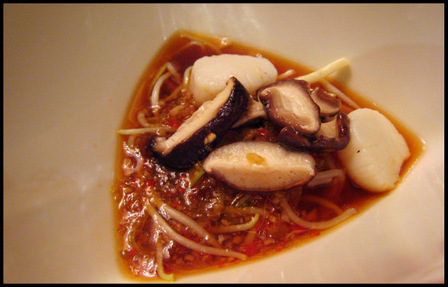 One of the most memorable dishes was a noodles braised with mushroom in a spicy sour soup, characteristic of the part of China close to its Indochinese neighbours. Thanks KS! The next day husband took V to the zoo. I went for a Pilates session and sent my quilt for professional quilting. Lunch was at Patara in Tanglin Mall, they serve very competent Thai food in an upmarket setting. Dinner was with the Makankakis on their monthly event. This time we revisit Old Mother Hen at 136 Sims Avenue. The chef Jimmy has revamped the menu and their food is better than ever. The restaurant is 'poshed up' now with chandeliers and tablecloths but the cooking remains very much in the classic tze char tradition. When the fish came I made sure to clean up every last morsel of its delicious flesh. 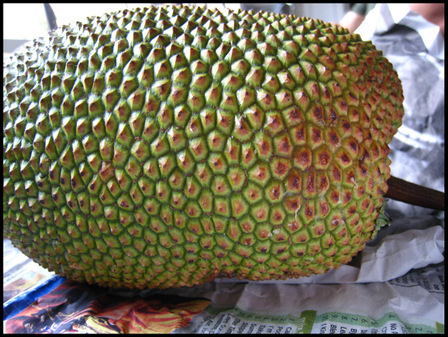 Then I wanted to eat durians and we went across the road to eat some. My holiday stomach is an amazing thing. The chef, at the end of a raucous dinner. 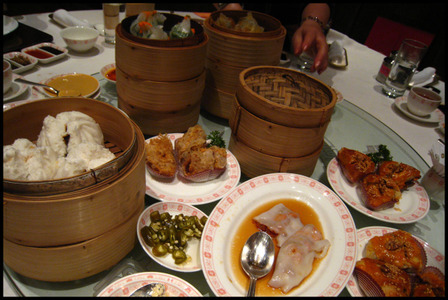 There was also dimsum at Crytal Jade Golden Palace with the bloggers. The same night Mia The Skinny Epicurean organised a dinner with other bloggers at Hokkaido Sushi. I had been particularly looking forward to this because this is Chef Thomas Kok's new venture. 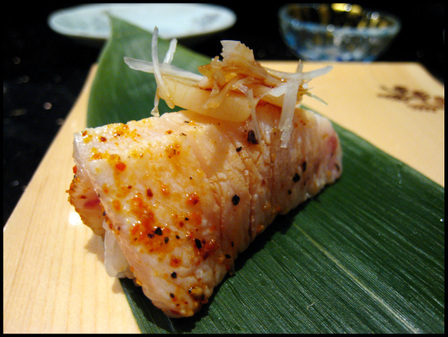 After some lost years at Kaisan he found his rhythm at Tomo Fine Dining but this is even better. 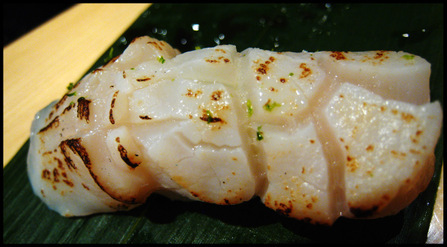 Fresh seafood flown in directly from Hokkaido, only the very best is served here and we had a hell of a good time. So good I came back with husband and V just before we flew home. 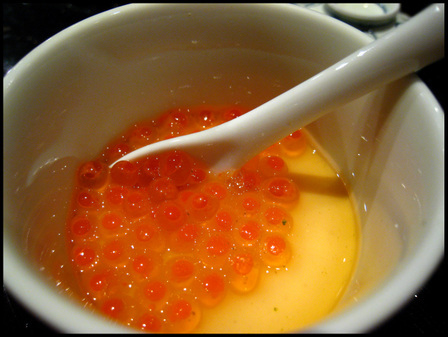 Our degustation menu had everything that was delicious like Hokkaido crab, chawan mushi with ikura, squid marinated in garlic soy, fish noodle soup and sushi so perfect we were asked to eat it with our hands for maximum enjoyment. The Thomas came by and decided we needed more food.He asked the waitress to serve us foie gras chawan mushi. Later more good stuff would arrive. 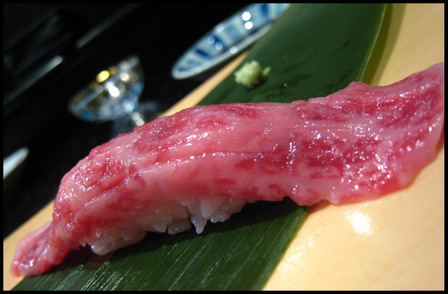 This is not a fish sushi but beef sushi. Very special beef. The meat was so tender and sweet hardly any chewing was required. The only thing to do would be to close your eyes, savour the exquisiteness and thank your lucky stars. 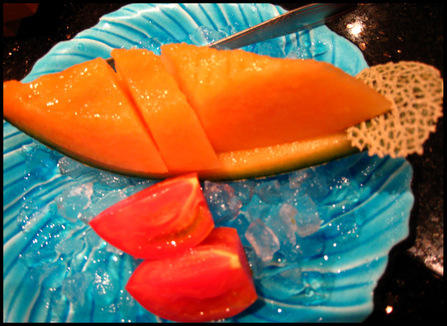 To finish, we had beautiful Furano melon and fruit tomato. Thank you Thomas you are magnificient. I enjoyed the lunch very much. The heat level was just nice for me though the die hard chilli fans like TTC, Superfinefeline and my husband would beg to disagree. 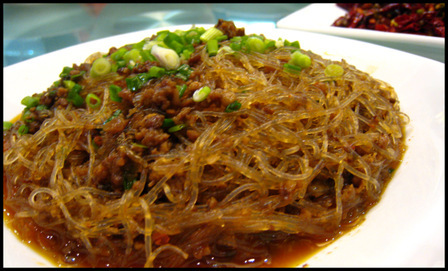 Bean thread noodles with minced meat. 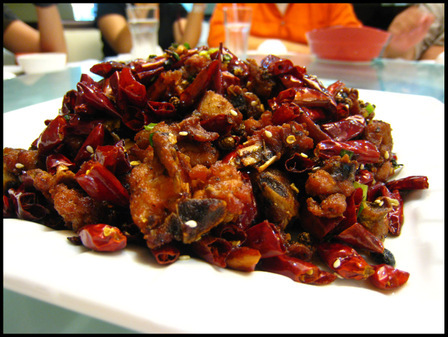 La Zhi Ji, or spicy pepper chicken. Very fragrant but not too hot. After all that hot food we cooled down with desserts at nearby Temple Street. 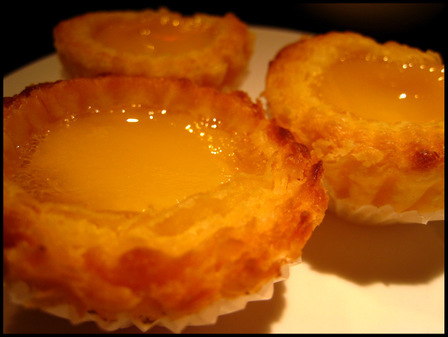 V became acquainted with more Chinese desserts like peanut soup which she loved as she is already a peanut butter lover. It seems like I am rushing this entry and it's true. I have to go pick V up at school. 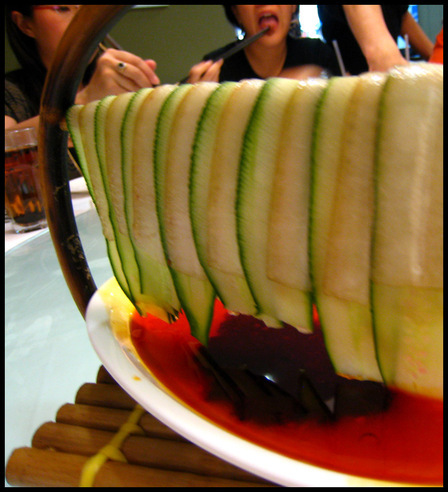 So to finish, here is an image of the wo-peng at Asia Grand Restaurant in Bugis where we had dinner with good friends and ex-colleagues. We ate and drank well and then we proceeded to S's house to drink more wines and enjoy the televised opening ceremony of the Beijing Olympic Games. The following day we went back to KL, which I will detail in Part II. Bon Weekend à tous! 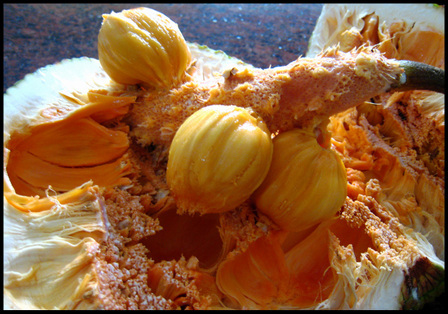 Can you guess how many seeds were in this fruit? 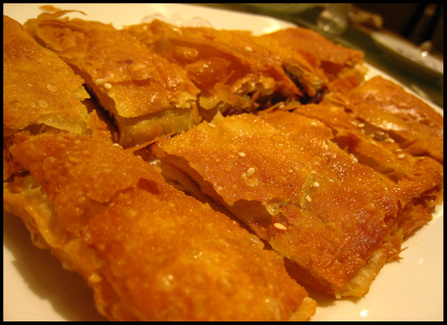 Chan-che asked as she cut up the cempedak which had been sitting in a corner of the kitchen for three days. Its ripening aroma was driving me nuts but the timing must be right if we want to eat it at its ripest and most succulent point. Finally my mother said it was ready to eat and Chan Che cut it up with an oiled knife. One look inside and she said, I doubt there's more than 10 seeds inside. My mother took over next, scooping up each piece of creamy pulped seed into a bowl. There were only 6 seeds, pathetic indeed. Mother urged me to eat all of them, after two seconds of hesitation I plunged right in, thanking her appreciatively. The flesh was sweet and creamy, the distinct pungent aroma left me wanting more. Mum peeled the bits of flesh around the inside of the husk, these were equally delicious. Our trip home was kicking good. It would be an understatement to say that we were spoiled rotten by our families and friends. 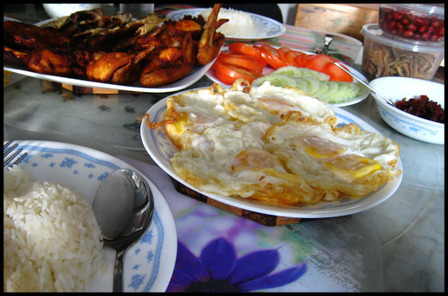 From the moment we landed till the time we took the taxi to Changi airport we and our tummies were well taken care of. 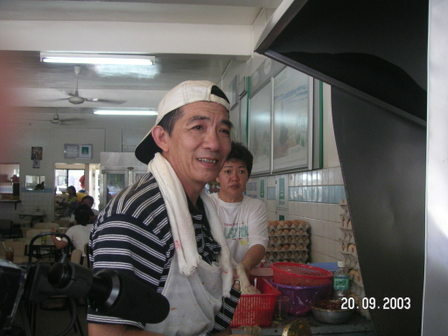 In Singapore we stayed with the Lims, well known for their unstinting generosity and kindness. 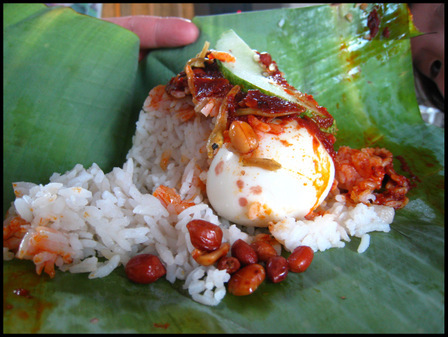 When we arrived at their house at 7 a.m. we found our breakfast waiting for us: home-cooked nasi lemak. 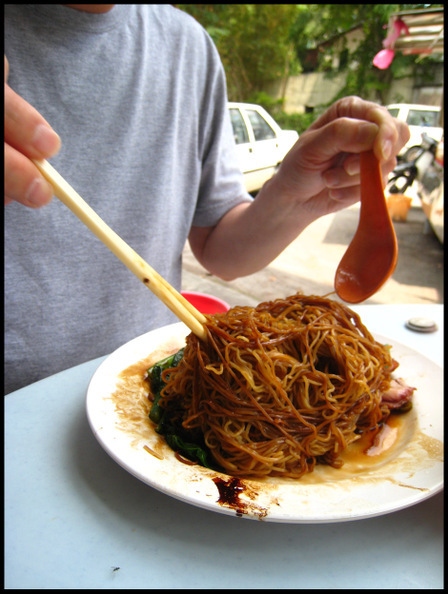 On other mornings we enjoyed the likes of beef hor-fun, roti prata and mee goreng. Their cook even made dinner for V every night. This and so many other personal hospitality touches prove them the most perfect hosts, we were very fortunate indeed. Back home in KL, my mum was not in a cooking mood. She was short of one helper in the kitchen so she decided that we would eat out more often. Anyway, she is not the type to cook fancy breakfasts, a pot of congee or the occasional fried beehoon would be the most she would stretch to in the mornings. Breakfasts is more likely to consist of takeaway chee cheong fun from the Bangsar market or whatever is available in the kitchen. 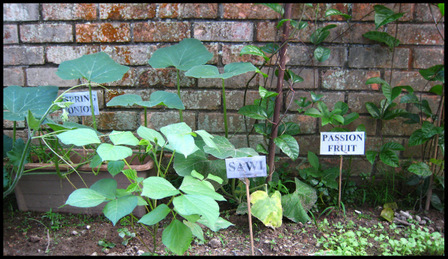 This time round, what was available were papayas, plucked from her tree in half-ripened stage and wrapped in newspaper to continue ripening safely away from the birds that visit her vegetable and fruit garden. There were about 4 or 5 pieces in various stages of ripening. 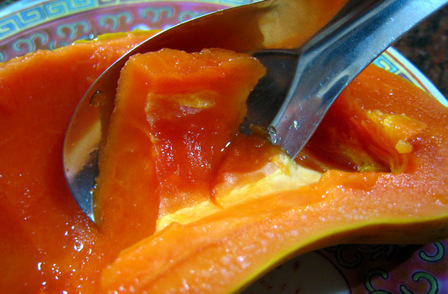 Every morning I unwrapped them to pick the ripest specimen, and that would be breakfast shared between me and V. I love the papaya from my mother's garden, she grows them as organically as she can and the fruit is very sweet without that faint sickly smell associated with Malaysian papayas. 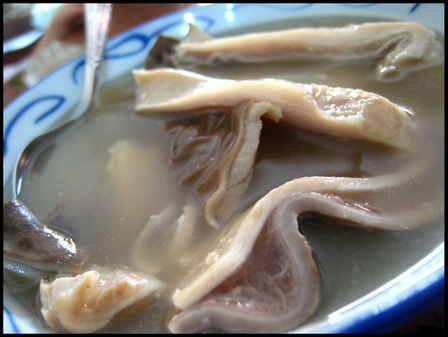 For husband, he was very happy to come home one day to a bowl of pig stomach soup. Mother had especially ordered four pieces of stomachs from the butcher. The thoroughly cleaned stomachs were packed with fresh whole peppers before boiling. Surprisingly clear tasting and yet meaty, and delicious too. Husband had two big bowls. Not pictured but this time round we hit jackpot with our durian eating. We arrived in full season. In Singapore we enjoyed a late supper of designer "Cat Mountain" durians but these pale to the special kampung durians from Malacca that our maternal grandmother gave to our mother. These were so delicious we ate and ate until our stomachs threatened to burst- the seeds were tiny, the flesh creamy and melting, all tantalising with their mutlifaceted sweet-bitterness and amazing bouquet. Lousy durians are a waste of calories but good durians is the secret to world peace. Once they figured out how to transport it without setting off sniffer dogs and the smell police. Less odoriferous perhaps and more transportable are twisties and murukku which I loaded up one check-in baggage of to remind me of home. The chickpea murukku was bought at an Indian grocery stall at the Machap rest-stop along the North South highway, they were very good being judiciously spiced and freshly made. 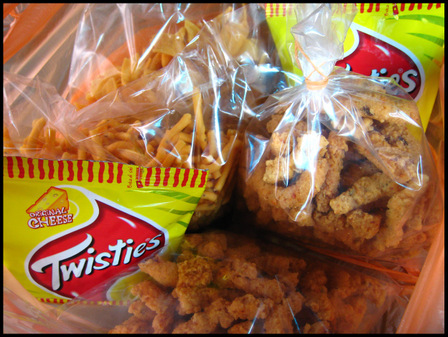 It also puzzles me a little that the Twisties packet states that it should be sold only in Malaysia. I hope they don't take my stash before I have a chance to finish them!